3.82. Lung conditions, including lung cancer, are estimated to cost wider society around £9.9 billion each year . Respiratory disease affects one in five people in England, and is the third biggest cause of death . Hospital admissions for lung disease have risen over the past seven years at three times the rate of all admissions generally  and remain a major factor in the winter pressures faced by the NHS. Over the next ten years we will be targeting investment in improved treatment and support for those with respiratory disease, with an ambition to transform our outcomes to equal, or better, our international counterparts. 3.83. Incidence and mortality rates for those with respiratory disease are higher in disadvantaged groups and areas of social deprivation , where there is often higher smoking incidence, exposure to higher levels of air pollution, poor housing conditions and exposure to occupational hazards. Chapter Two detailed the NHS’ contribution to tackling these risk factors. 3.84. The NHS will do more to detect and diagnose respiratory problems earlier. Currently around a third of people with a first hospital admission for a COPD exacerbation have not been previously diagnosed . From 2019 we will build on the existing NHS RightCare programme to reduce variation in the quality of spirometry testing across the country. Primary care networks (detailed in Chapter One) will support the diagnosis of respiratory conditions. More staff in primary care will be trained and accredited to provide the specialist input required to interpret results. 3.85. Pulmonary rehabilitation offers a structured exercise and education programme designed for those with lung disease or breathlessness. 90% of patients who complete the programme experience improved exercise capacity or increased quality of life . However, it is currently only offered to 13% of eligible COPD patients, with a focus on those with more severe COPD . By expanding pulmonary rehabilitation services over 10 years, 500,000 exacerbations can be prevented and 80,000 admissions avoided. To increase access to pulmonary rehabilitation, a population-management approach will be used in primary care to find eligible patients from existing COPD registers who have not previously been referred to rehabilitation. New models of providing rehabilitation to those with mild COPD, including digital tools, will be offered to provide support to a wider group of patients with rehabilitation and self-management support. We will increase the number of patients with COPD who are referred to pulmonary rehabilitation where this is appropriate through the use of the COPD discharge bundle. 3.86. We will do more to support those with respiratory disease to receive and use the right medication. 90% of NHS spend on asthma goes on medicines , but incorrect use of medication can also contribute to poorer health outcomes and increased risk of exacerbations, or even admission. Pharmacists in primary care networks will undertake a range of medicine reviews, including educating patients on the correct use of inhalers and contributing to multidisciplinary working. As part of this work, they can also support patients to reduce the use of short acting bronchodilator inhalers and switch to dry powder inhalers where clinically appropriate, which use significantly less fluorinated gases than traditional metered dose inhalers . Pharmacists can also support uptake of new smart inhalers, as clinically indicated. 3.87. Pneumonia continues to place a huge burden on the NHS – improving our response will help to relieve the pressure, particularly during winter. Community-acquired pneumonia is a leading cause of admission to hospital, despite being avoidable in many cases . Pneumonia also disproportionally affects older people, with incidence doubling for those aged 85-95 compared with 65-69 . For every degree drop in temperature below five degrees Celsius, there is a 10.5% increase in primary care respiratory consultations  and a 0.8% increase in respiratory admissions . 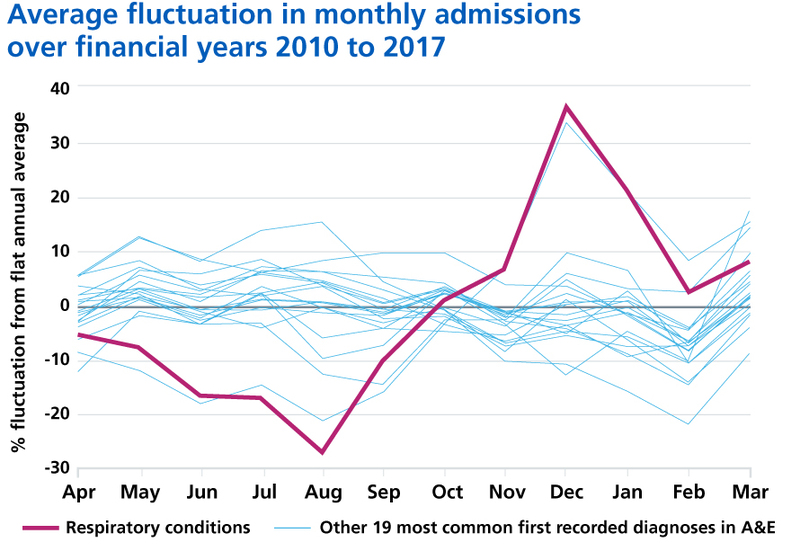 Acute pneumonia admissions have risen by 35% since 2013 with stays in hospitals getting shorter, indicating admission may not have always been essential . Consistent use and application of risk scoring for deteriorating patients may reduce avoidable admissions to hospital. Patients identified with community acquired pneumonia in emergency departments will be supported to be cared for safely out of hospital by receiving nurse-led supported discharge services, as set out in Chapter One. 3.88. Enabling more people with heart and lung disease to complete a programme of education and exercise based rehabilitation will result in improved exercise capacity and quality of life in up to 90% of patients. Breathlessness is a very common symptom that is shared by a number of cardiac and lung conditions as well as psychological and mental health conditions, and is compounded by physical de-conditioning. Generic pulmonary and cardiac rehabilitation programmes have been shown to be effective for both conditions, providing an opportunity for cardiac and pulmonary rehabilitation groups to join forces and manage the groups collaboratively . Test and learn demonstrators will be used to establish an evidence base for joint cardiac and pulmonary rehabilitation models, which will then be promulgated across the NHS. 141. Chalabi, Z., Erens, B., Hajat, S., Heffernan, C., Jones, L., Mays, N., Ritchie, B. & Wilkinson, P. (2015) Evaluation of the implementation and health-related impacts of the cold weather plan for England.